The bedroom should be a room to retreat from the rest of the world, a place where you can rest your body and mind. When decorating the bedroom keep in mind that the fabrics, colours, structures can make a difference. And the most important element to consider is the comfort. We can get lost in choosing the wallpaper, the bedlinen, making a colour harmony while most of our attention should go to choosing the right mattress: the quality as well as the size, keeping in mind the size of the room. When we think of the bed we have to consider all the parts: headboard, frame, mattress, spring box. A simple headboard or a complete bed will define the style: in wood, combined with fabric or completely upholstered in a beautiful fabric. The mattress is the most important part. Mattresses are designed to provide the support and comfort you need to relax and rest. 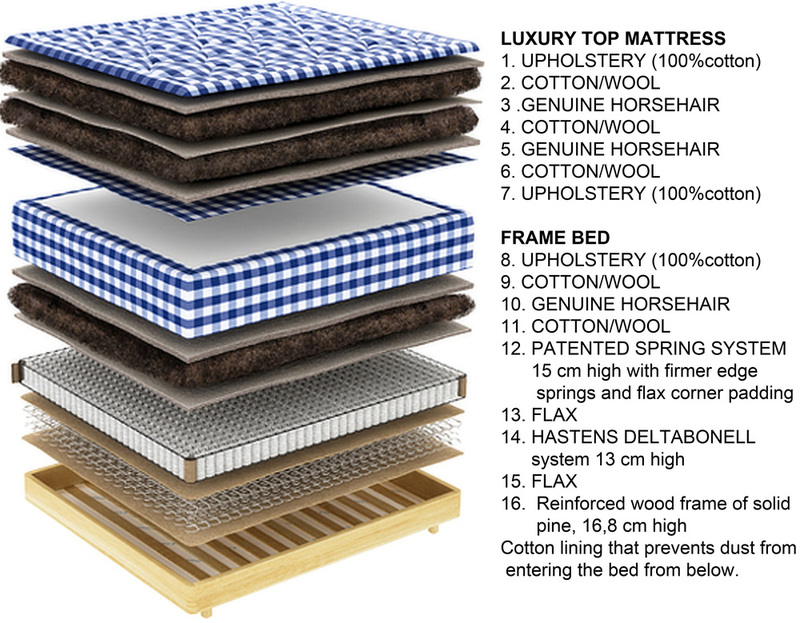 A mattress may consist of a quilted or similarly fastened case, usually of heavy cloth, that contains hair, straw, cotton, foam rubber, etc., or a framework of metal springs. Mattresses can also be filled with water or air. The bed and the mattress were invented around 10.000 BC, the bed was raised from the ground to avoid drafts and dirt. The first mattress probably consisted of a pile of leaves, grass, straw with animal skin over it. Early mattresses contained a variety of natural materials including straw, feathers or horse hair. Modern mattresses usually contain either an inner spring core or material such as latex, or flexible polyurethane foams. Innerspring mattresses are the oldest and one of the most popular of modern mattress designs. Manufacturers use a variety of steel coils support systems to construct these durable mattresses. Then they cover the innersprings with various types of padding or upholstery materials, which result in a surprisingly comfortable sleep experience. Hybrid mattresses represent the ultimate technological innovation: combining combining two or more different types of support systems, the memory foam with and advanced innerspring system. The benefits of memory foam while retaining the classical look and feel of an innerspring. Memory foam has the unique ability to conform to your body, making it ideal for achy joints and restless sleepers. Latex mattresses were introduced to consumers only in the 1960's. They offer big advantages: they are more durable, resilient mattress materials. They give proper alignment to the body, as a result they help reduce and/or prevent pain in sensitive parts of the body. Foam mattresses, constructed of different weights and densities of petrochemical-based flexible polyurethane foam, provide a cost-effective alternative to more sophisticated mattress options. We can approach the decoration of a guestroom in a different way as we do the master bedroom. It can be a room with multiple functions: used as an office with an convertible sofa, a room to relax. So we can also look for another type of mattress. When we go for an convertible sofa the mattress comes with it. Or we can choose a futon, which can easily be turned from sofa into bed. A futon is handmade out of natural materials such as cotton. The cover is not removable and the filling is kept in place by buttons. A handmade mattress in a decorative fabric, also called ticking, can be a decorative element in the room and combined with a lot of cushions it makes a perfect sofa or daybed. At the exhibition " Volez, Voguez, Voyager" at the Grand Palais in Paris earlier this year, you could see that Louis Vuitton has always been at the avant-garde of creation.They developed the unique capacity of being able to pack and transport whatever needed, even a small bed to relax during the travel. The bed should be the place where you want to spend all day: having a lazy start with breakfast in bed, reading till late in the night. With bedsheets made out of the finest cotton or fresh crisp linen. attention: most conventional mattresses are made of petroleum-based polyester, nylon, and polyurethan foam, and treated with flame-retardant chemicals. They emit VOCs which can be dangerous to human health or cause harm to the environment.